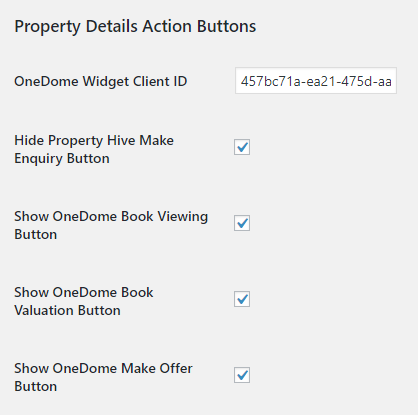 If you’re using the OneDome software whilst using Property Hive for your website, this new add on allows you to bring the two together by ensuring data entered through the website goes straight into OneDome. With this brand new add on you can replace the existing ‘Make Enquiry’ button that comes with Property Hive with the ‘Book Viewing’ functionality from OneDome. This means any viewings booked through your WordPress website will appear instantly within your OneDome account. We’ve also added support for ‘Book Valuation’ and ‘Make Offer’ functionality too so, like viewings, these booked on your estate agency website appear within OneDome right away. Within the settings area of the add on in WordPress you’ll have the ability to select which actions are to show on the property details page. We’ve also added a handy [onedome_book_valuation_button] shortcode so you can place the ‘Book Valuation‘ button anywhere on your website quickly and easily.